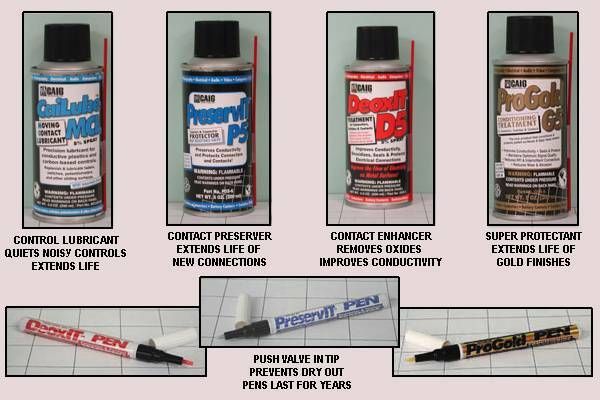 PreservIT lubricates and seals brand new connections. Extends contact life. MCL lubricates and seals controls like volume pots and mixer sliders. DeoxIT removes metal oxides and leaves a lubricant/sealer. Extends contact life. ProGold is a premium gold lubricant/sealer. Extends contact life. The active ingredients bear the name of each product and are proprietary. The solvent carrier in the sprays may harm certain plastics so it is a good idea to be careful and if necessary mask off areas from over spray. The spray heads are adustable to control the strength of the spray from low to medium to high. The really great features to take note of with all Caig contact enhancement products is the ease of use and long effectiveness. Founded in 1956, Caig is a leading supplier of contact enhancement and maintenance products. Casino's, copier tech fleets, anywhere electrical contacts are relied upon for reliability and important functions, you'll find Caig products. Your hi fi should be no exception. The sprays are only 5% active ingredient, so it is nearly impossible to "over apply" them. Spray application is great for getting into tight spots, or into volume controls. Sprays are also good for dirty environments where re - contamination may be a problem. The pens dispense 100% active ingredient and as such should be used sparingly. Also, since the tip is in direct contact with the part being treated, pens are best used in clean environments to prevent contaminating the tip with a dirty contact. Replacement tips are available. We use the pens on all phono cartridge pins before attaching the wires and on all IC sockets before inserting the IC.